Fans of Rico Blanco, this piece of good news is for you. 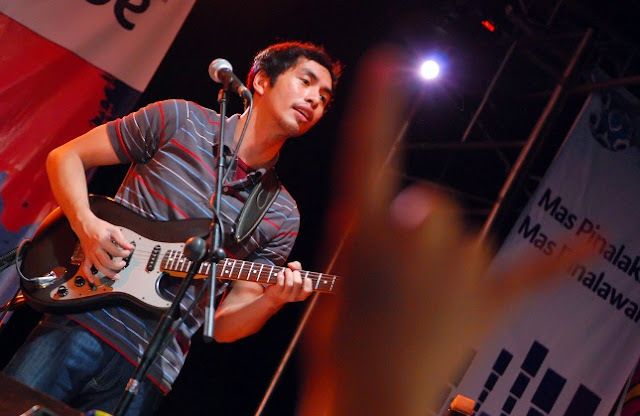 The former Rivermaya front-man is reportedly working on a new album scheduled to be released sometime this year. The singer has just signed a contract with Universal Records Philippines. Universal Records confirmed the contract signing by posting "Rico Blanco joins Universal Records" on its official Twitter account. Blanco also tweeted, "New album out next month." If this is true and things go according to plan, fans of the rocker can get hold of his new album this coming November. No album title nor a specific release date has been announced yet. The upcoming album will be Blanco's third studio album as a solo artist. His first two efforts were Your Universe (2008) and Galactik Fiestamatik (2012). The two albums spawned hits like Yugto, Your Universe, Antukin, Ayuz, Amats, Burado, and Lipat Bahay. Late in September, Blanco released a single wherein he collaborated with the popular rock band Parokya Ni Edgar. The song is called Sing and it's now available for sale on iTunes and Amazon. The song encourages listeners to forget their problems, swipe aside anything that's bothering them and just sing because "the universe is waiting". Listen to the song below.